Suitable for many places: kitchen,dining room, office, and coffee house. This is a kind of bar stool you cannot miss. 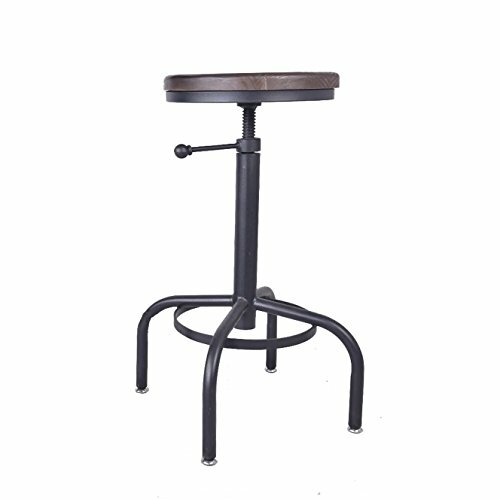 It's industrial and vintage style can make your house or the bar or coffee house more stylish and attractive.360 degree swivel height adjustable make you feel comfortable and have a nice coffee or dinner. Note:There may be a little color difference, any problem please contact us without heistate. 360 degree swivel height adjustable(about 15cm) and footrest make you feel comfortable and relax. Material: Solid wood+ Iron, very stable and durable. If you have any questions about this product by VINTAGELIVING, contact us by completing and submitting the form below. If you are looking for a specif part number, please include it with your message.